Separation Anxiety is probably the most common behavioral problem in dogs. And, not only does it cause your Miniature Schnauzer emotional distress..... it will drive you crazy too. Dogs suffering this disorder when left alone stress out, panic and display all sorts of unwanted behaviors, like: howling, and whining. An in more severe cases, behaviors become destructive like: chewing and destroying shoes, furniture, rugs, or worse yet, urinating or defecating in the home. It's important to recognize the signs early on, so you can come up with the best solution to put an end to it quickly. Through behavior modification and the help of some calming aids, your Schnauzer will begin to accept the fact that he will be alone for a while, but that you are coming back. In fact, he may begin to enjoy his alone time... as long as it's not too long. Your dog wasn't properly socialized as a pup. You have a newly adopted dog. Your dog was previously abused dog. There was a change in your work schedule. A change in your household ~ a new baby. A change of residence ~ moved to a new home. Dogs with limited vision or blind dogs. It is important for you, the owner, to understand that your dog is not being destructive intentionally. So please don't return home and scold or punish your Miniature Schnauzer for the destruction. That will only intensify your dog's anxiety and even make him fearful of you, and you definitely don't want that to happen. So What's An Owner To Do? The first thing you need to do is find out the underlying cause of your dog's anxiety. Once that is determined, you can begin to resolve the problem. If possible, it would be great if you could set up a pet cam. This way you could actually see what your Schnauzer is doing while you're away. It will help you determine if your dog is truly suffering from separation anxiety because of your absence or if your Schnauzer's acting out due to boredom. If your Miniature Schnauzer begins bad behaviors the moment you leave the home with barking, whining, etc.. and then proceeds to even more destructive behaviors, your dog probably does suffer from separation anxiety. If however, your Miniature Schnauzer roams around the house, takes a nap, gets up, stares out the window barking at passers-by, and eventually begins chewing on furniture, shoes, etc... you're probably dealing with a bored dog. Bored Dog Tip: A quick fix to help a bored dog is to be sure and leave some fun puzzle games and treats like these interactive dog toys which will help keep him busy and entertained when he is left alone. The most effective approach when dealing with a dog that suffers with separation anxiety is through behavior modification and many have also had success with herbal treatments or anti-anxiety medication. Depending on why your Miniature Schnauzer is acting out, one of the following suggestions just might solve your problem. Exercise - Take your Miniature Schnauzer on a brisk walk or some other vigorous dog exercise or play before leaving your home. A tired dog is a happy dog and one that will more likely nap while you're away. 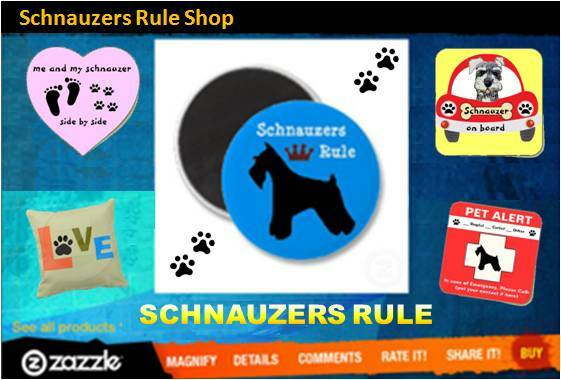 Special Treats - Just before leaving the house, give your Miniature Schnauzer some special treat. A treat he only gets when you leave the house. Since these treats are only allowed while you're away from home, your Miniature Schnauzer will begin to associate being alone with a very special reward. Bully Stick Dog Treats are long lasting treats that should keep your Miniature Schnauzer entertained a long while or maybe a KONG Goodie Bone Dog Toy filled with some yummy treats your dog has to work for his reward. Herbal Treatments - A holistic approach includes wholesome nutritious foods, plenty of exercise, a secure home environment, and many dog owners also benefit by adding a natural stress relief like Rescue Remedy or PetCalm. Another easy-to-use calming aid is Comfort Zone W/D.A.P. Diffuser. It simulates natural calming pheromones that help soothe dogs especially in stressful situations and can reduce or completely stop stress-related behavior including: barking, whimpering and whining, chewing, urination and defecation. It actually reduces or eliminates separation anxiety and calms dogs during thunderstorms and Fourth of July fireworks or when left home alone. 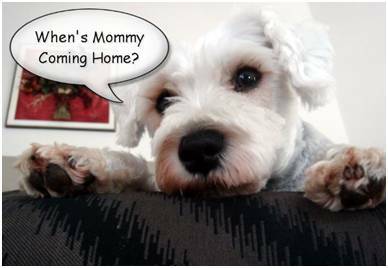 Pet-Sitter - Consider hiring a pet-sitter or dog walker to help make the time you're away from home more bearable for your Miniature Schnauzer. Keep Calm Yourself - Dogs have a way of reading our emotions and actions. Upon departure, just give your Miniature Schnauzer a quick pat on the head and leave. Don't act upset about the fact that you're leaving him alone. And stay calm when you return home, too. Making a big fuss with lots of kisses and saying I'm Home, I'm home... will only reinforce and enhance the downside of being left home alone. Just greet your Miniature Schnauzer calmly and then proceed with your normal routine (check the mail, change your clothes etc...) and after your dog calms down a bit, that's when you should show him attention and/or take him for a walk. In the end, day after day, being left alone will naturally become part of your dog's routine. By implementing the above suggestions slowly, your Miniature Schnauzer will learn that being left alone is not a bad thing. Shop on Amazon for all kinds of calming aids for dogs including relaxants, treats, supplements, and even relaxing music for your dog to enjoy. Music Dogs Love CD A collection of calming music and soothing sounds for dogs. Over one hour of relaxing music mixed with soft nature sounds and short stories, creating a peaceful environment for dogs who are left alone. Exotic birds, children playing, soothing voices, and sonic sounds only dogs hear, are just a few of the effects that come in and out of this beautiful music to entertain your pet while you are gone. DVD For Dogs: While You Are Gone A collection of calming and soothing sounds from a walk through the woods: deer, ducks, geese, wolfs, prairie dogs, birds, horses, fish, butterflies, and more. There's also a virtual game of fetch. These soft nature sounds, music, sonic sounds only dogs hear, and short stories create a peaceful environment for dogs who are left alone. Now you'll never have to leave your dog home alone again!